Build These Walls Page by Page | Flickr - Photo Sharing! We've been having gloomy grey weather for what seems like a month, I feel like it drains the colours and energy out of the world around me and makes me feel like all I want to do is stay inside and read. Cameron Skinner, Samantha Stock, and 249 other people added this photo to their favorites. love the tones here, and the sky is amazing!! Your love for reading is incredible! 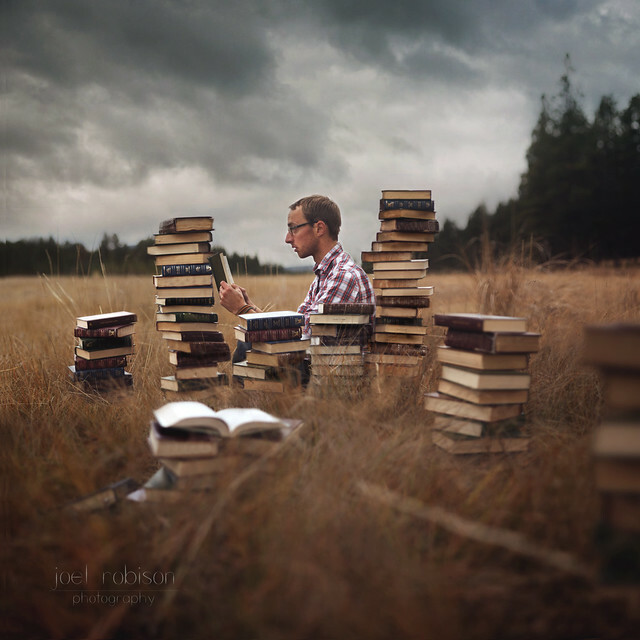 Your photos with books are very nice! a delightful thought beautifully expressed. This is lovely! I love the sky! great vision my friend. i am starting the journey to do the same. thanks for always sharing!!! Same here - it's raining outside and very overcast. I'm rereading the Iron Druid series for the 2nd time. The new book is coming out at the end of this month - can't wait! This is such a cool concept! I know how it is when it's just constantly gloomy and the sky is overcast (luckily not a problem currently). I love how you composed this. amazing concept joel . . LOVE IT !!! You're just awesome Joel ! Like always this is just mind blowing !